Stock bags and printed labels go hand-in-hand in today's packaging market. So much so that in our commitment to providing outstanding service for our customers, we have several semi-automatic machines available for adhesive label application. Our various machines are equipped to accommodate a wide range of bag and label sizes which makes it easy for us to satisfy our customers' label needs. With this technology, labels are applied with high precision and low wastage rates, so there are no more wasted bags or labels due to inaccurate label position. The speed of these machines allows for quick turn-around time and ensures your bags are delivered on time, every time. Take advantage of this valuable service today for a minimal fee. There are certain label layout requirements in order for the labels to run properly on our machines. Please download the Labeling Service Specifications PDF for detailed information. Make sure to leave the edges of your label needs to be at least 1/4" away from the left and right side of the bag and 1/2" away from the bottom of the zipper and the bottom of the bag. Although a great printed bag or pouch might be an excellent way to grab a customer's attention, not every company is ready to take that leap into custom bag design and others prefer a more homemade or personal look. 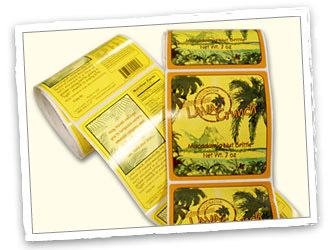 Custom printed labels may be the most ideal solution for your packaging vision or budget. We work with seasoned label printers with years of experience in the print industry to provide you with the most cost effective and high quality labels. 1. Colors 2. Label Size 3. Shape (Rectangle, Circle, Oval, Other) 4. Material (White paper or Foil) 5. Adhesive (Permanent, Removable or Freezer) 6. UV Coating, Matte Coating, Gloss Lamination or Matte Lamination 7. Number of Versions 8. Total quantity per version 9. Tenka Label Application Service or You (the client) will self apply. Don't worry, if this is your first label project, our sales team will be able to guide you through the process and will ensure the best solution is found for your particular needs. Shelf-space utilization is a key component to marketing your product. Making the most of the limited shelf-space that retailers provide can be a difficult task. We realize that our customers may be faced with challeng-ing display options and we are dedicated to providing various alternatives and solutions. Our ability to apply custom hang holes to our stand up pouches and flat pouches allows for greater expandability when consi-dering the presentation of your product. Hang holes make use of end-of-the-aisle display strips and peg boards rather than restricted shelf-space or unfavorable shelf position. Let us help to give your product marketing versatility today. Resealability is quickly becoming one of the main points of concentration in consumer-friendly packaging. Side-gusseted bags have always been an admired choice for our customers, but the ability to be resealable isn't one of their strong points. Because of this bag's popularity, we didn't want our customers to be dissuaded because they're missing this feature. 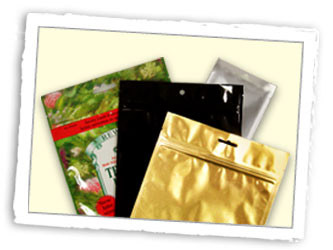 Therefore, we've made several different size adhesive-backed tin ties available for use on our gusseted bags. The addition of this accessory gives our gusseted bags the reclosable option and creates supplementary aesthetics. Applying tin ties yourself could mean the loss of precious time and energy. Since it is our goal to make your packaging experience as care-free as possible, we've added automatic tin tie application machines to our collection. 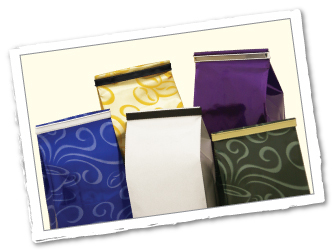 For a minimal fee, we can apply tin ties to your gusseted bags. Since tin tie application is completed in our warehouse, we have the ability to customize the location of the tin ties to complement your label and/or valve placement. 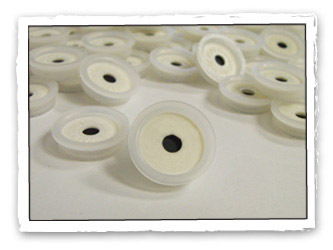 As you probably already know, an air tight package is essential to keeping your products fresh. When packaging products that emit gases after the bags are sealed, the bags often expand and the gases inside need to be released to prevent bursting. Our patented one-way degassing valve was created to allow those excess gases to escape without letting outside air substances back in. This device is designed to keep your product fresh while also serving as a pressure relief system. It was mostly used in the coffee industry but is now being used in expanding applications. We understand that many of our customers will also be applying labels to our valved bags, so we make it easy to customize the valve location so that it doesn't interfere with your label placement. Simply let us know where you want the valve applied and we'll take care of the rest.